Gastric cancer is the fourth most common cancer and the second leading cause of cancer deaths worldwide . Except countries such as Korea and Japan that have routine national screening programs, most patients with gastric cancer are in advanced stages of the disease as early-stage gastric cancers are usually without symptoms and often develop advanced stage even after radical surgery. Despite developments in the surgical treatment of gastric cancer, there is a relatively high recurrence rate. Specifically, the 5-year overall survival rate for all diagnosed patients averages 24.5% in Europe  and 40–60% in Asia [3, 4]. The main reason for post-surgery treatment failure for gastric cancer is peritoneal dissemination, which is caused by the seeding of free cancer cells from the primary gastric cancer. This is one of the most common types of metastasis for gastric cancer. Gastric cancer patients with macroscopic peritoneal metastasis have very poor prognoses, with a median overall survival of 3–6 months [5, 6]. 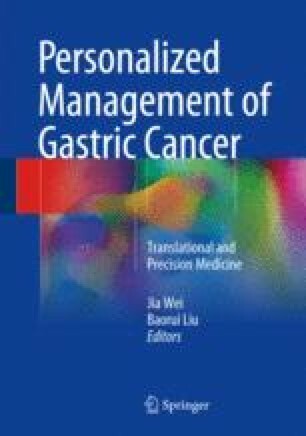 In this chapter, we try to describe the influence of peritoneal metastasis on survival in patients with gastric cancer, the possible mechanism of peritoneal metastasis, and individualized treatment strategy of gastric cancer patients at high risk for developing peritoneal metastasis.